BCB President Hilbert Foster hands over donation Ruthel Henry. Those were the words of an emotional President of the Berbice Cricket Board Hilbert Foster as he launched the Board’s Dare to Dream Programme for 2018. 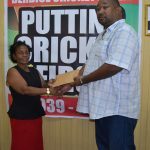 The Berbice Cricket Board under the programme made a financial donation to long tern Berbice Cricket Office Assistant/Cleaner, Ms Ruthel Henry. Henry, a mother of two always dreamed to construct her own home and had informed the Berbice Cricket Board President of some of the difficulties she was facing. Henry, he stated has been a faithful and hardworking Office Assistant/Cleaner of the Berbice Cricket Board for the last eight years and is one of the main reasons why the Board had been successful under the Presidency of Keith Foster and Anil Beharry. An emotional Henry stated that she was pleasantly surprised that Foster and the Berbice Cricket Board would go out of their way to assist her.